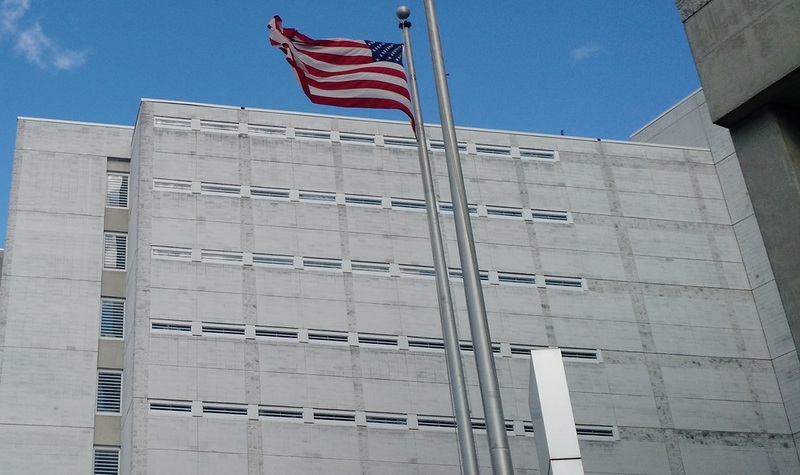 In the early morning hours of January 19th, Matthew McCain suffered a seizure in his cell at the Durham County Detention Facility, a white, narrow-windowed monolith at the heart of Durham’s revitalizing downtown. Inmates in his pod yelled for help and repeatedly pressed emergency call buttons but, according to witnesses, these calls were unanswered by the officer on duty. McCain died at approximately 5:30am. He was twenty-nine. His new daughter, Kinslee, had been born just a few weeks prior, during McCain’s incarceration. He never met her. McCain had been incarcerated since August, awaiting a trial date that was repeatedly pushed back. Throughout that time, he frequently told his family and his girlfriend, Ashley Canady, that the jail was not providing adequate medical care. McCain suffered from epilepsy and diabetes, and he reported that he could not get consistent insulin treatment, despite frequent requests. His anti-seizure medication, Dilantin, was also administered incorrectly. According to Canady, his prescription called for nightly doses, to lower the risk of seizures while he slept. Instead, medical staff gave him his insulin and his Dilantin together, during the day. Some days he received no medication at all. “No one should have to beg to have medication,” said Canady, who helped McCain file official grievances against the jail and its low-cost, private medical provider, Correct Care Solutions. In November 2015, McCain started writing Canady more frequently, sometimes four or five times a week, reporting that he was getting sicker. During phone calls, he worried aloud that he might die in the jail. “I’m not going to make it up out of here,” he told Canady. “Tell everybody to pray for me,” he told another family member. Canady attempted to secure McCain’s transfer to Central Prison, in Raleigh, where he might receive better medical attention in the prison hospital. Her request was denied. For years, inmates have reported inadequate medical care, neglect, and abuse in the Durham County jail. To their families and their advocates, they claim that illnesses go untreated, severe pain is dismissed with a few ibuprofen, x-rays and lab tests are discouraged, and hospital release is so unlikely that surgeries are delayed until the situation is more dire. In letters, they describe day-to-day problems like unsanitary sleeping mats and food trays, cold cells and inadequate blankets, and inflated fees for medical attention. For several months in 2015, inmates were collectively punished with a jail-wide “lockback.” At the height of the lockback, they were confined to their cells for forty-six hours out every forty-eight hour period, with only two hours every two days in which to shower, exercise, call loved ones or legal help, purchase items in the commissary, or access writing instruments and educational resources. In April 2015, the jail was found to be inadequately supervising inmates. In October, the North Carolina Department of Health and Human Services found that the jail’s medical plan violates state rules. In December 2015, two detention officers were fired for holding an inmate down and repeatedly punching her in the head. That year, two other inmates, Dennis McMurray and Raphael Bennett died in custody. There were twelve suicide attempts. These tragedies do not capture the public’s attention. Administrators do not publicly announce in-custody deaths, except to registered next of kin and official oversight bodies, and inhumane conditions don’t make headlines by themselves. But more than this, the Durham County jail, like other jails across the country, is a space of social neglect. Like prisons, jails function by separating, silencing, and rendering invisible the individuals housed within them. However, while prisons have captured journalistic, artistic, and scholarly attention, jails remain relatively unknown to people who have no direct experience with them. This is partly because they are transitional facilities. The overwhelming majority of jail inmates exist in a legal limbo between arrest and conviction, where they are presumed innocent in the eyes of the law, but are deemed guilty by a public that equates detention with criminality. Because most inmates are waiting, sometimes for years, for society to render its judgment, jails are rarely stages for the spectacles of redemption and injustice that draw public attention. Almost no one in jail is “paying a debt to society,” because the debt hasn’t been drawn up. No one can be “exonerated;” they can only be discharged. No one receives the “death penalty;” they simply die in custody. The injustice of jail is unspectacular, everyday, and grinding. For those reasons, we rarely see it. Jail deaths are a similar, yet invisible, face of the police violence we see on our timelines and newsfeeds. The tools of witness and monitoring that people now use and demand in police encounters are ineffective beyond the jail entrance, beyond even the door of the police cruiser. Through police dash cameras, the public could bear witness to the frantic terror of Sandra Bland’s last moments on the outside—her refusal to cower, Officer Encinia’s refusal to treat her body with the respect he demanded from her. We see his brutality, her will to be free. Though we should never have to see anti-Black brutality for it to be believed, visual evidence has become necessary for any hope—however scant—of police accountability. But inside jails, the public and the families cannot see beyond the iron walls of discipline built with our collective resources, allegedly for our collective freedom. Through phone calls, letters, and the occasional release of a fragmented video recording, we can only surmise the conditions that make a healthy or stable person terminally ill, or suicidal, as allegedly happened to Bland in a Texas jail cell. We cannot imagine the justification for tasering a mentally ill person to death while in shackles, as police did to Natasha McKenna in a Virginia jail. We cannot trust the distinctions made between sudden death and homicide. We cannot trust that the system we support is intended to keep all of us safe. At a Durham rally for Matthew McCain and Dennis McMurray, the local community held open a space for family members to grieve in public, at the site of their loved ones’ deaths. An urgent question echoed from previous rallies for Sandra Bland, Natasha McKenna, and others who died in custody—What happened? We know that the overwhelming majority of jail deaths are categorized as illness-related (49.8%) or suicide (33.8%). We know that Black people, regardless of national origin, are 13.2% of the U.S. population, but 28.6% of all jail deaths. We also know that approximately 46% of jail deaths occur in the South, and that 76.3% of all jail deaths are people who were waiting in legal limbo, unable to post bond, and convicted of no crime. These facts, released annually by the U.S. Bureau of Justice, demonstrate clear racial, economic, and regional biases in these deaths. Yet they offer no explanation or insight for how, in the absence of malice or extreme negligence, a person could move from police custody to a morgue, sometimes within 24 hours. Or why, given the evidence of these deaths, the highest incarceration rate in the world, and profiteering at every level—from money bail and arbitrary bond determinations to extended ‘non-punitive’ pre-trial detentions, to exploitative court fees—the public should continue to legitimate the criminal justice system as a whole. In Durham, several civil society groups, including Inside-Outside Alliance, a coalition of activists and their incarcerated counterparts in the Durham County Jail, are fighting for an independent, community-led investigation of the jail and its policies.† The Durham County Sheriff’s Department denies the need for such an investigation, insisting that a visit from the National Institute of Corrections (NIC), a federal advisory organization with no accountability to the Durham community, will be sufficient to ensure that jail procedures are in order. An email from Tamara Gibbs, the Public Information Officer for the Sheriff’s Department, states that the NIC will “advise our office on best practices in detention care, and make recommendations, if necessary.” But if McCain’s mother could not even rely on the jail staff to be transparent about her son’s whereabouts hours after his death; if McCain himself could not rely on medical personnel to prevent his wholly preventable death; and if such obscure and preventable deaths are still occurring year after year, why should the public believe the NIC is any more capable of transparency and accountability than the Durham County Sheriff’s Department? In the face of uncounted murders and unexplained deaths in police custody, the even more innumerable brutalities both on the inside and outside of jail and prison cells, and the vast immunity of the police, their associates, and superiors, systemic change is not a choice. The evidence of things seen (and unseen) necessitate an alternative system. We require and deserve justice that restores, rather than destroys; security that does not treat individuals as disposable; a system that facilitates healthy choices, multiple chances, and community support rather than isolation and opposition. “We want justice, not just for Matt, but for everybody this has happened to,” said Canady. † One of the authors of this piece, Matt Whitt, is a member of another of these groups, the Durham Jail Investigation Team.